In Roman architecture, an insula (Latin for "island", plural insulae) was a kind of apartment building that housed most of the urban citizen population of ancient Rome, including ordinary people of lower- or middle-class status (the plebs) and all but the wealthiest from the upper-middle class (the equites). The term was also used to mean a city block. The traditional elite and the very wealthy lived in a domus, a large single-family residence, but the two kinds of housing were intermingled in the city and not segregated into separate neighborhoods. The ground-level floor of the insula was used for tabernae, shops and businesses, with the living space upstairs. Like modern apartment buildings, an insula might have a name, usually referring to the owner of the building. Strabo notes that insulae, like domus, had running water and sanitation. But this kind of housing was sometimes constructed at minimal expense for speculative purposes, resulting in insulae of poor construction. They were built in timber, mud brick, and later primitive concrete, and were prone to fire and collapse, as described by Juvenal, whose satiric purpose in writing should be taken into account. Among his many business interests, Marcus Licinius Crassus speculated in real estate and owned numerous insulae in the city. When one collapsed from poor construction, Cicero purportedly stated that Crassus was happy that he could charge higher rents for a new building than the collapsed one. 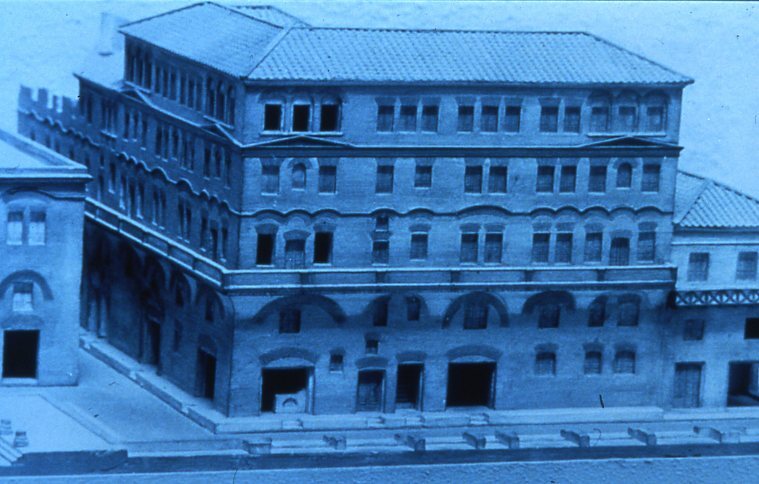 Living quarters were typically smallest in the building's uppermost floors, with the largest and most expensive apartments being located on the bottom floors. The insulae could be up to six or seven stories high, and despite height restrictions in the Imperial era, a few reached eight or nine stories. 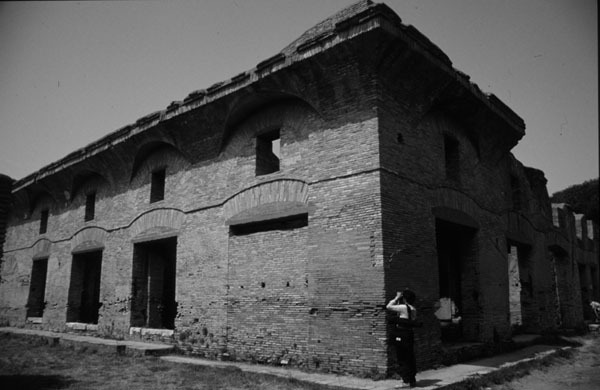 The notably large Insula Felicles or Felicula was located near the Flaminian Circus in Regio IX; the early Christian writer Tertullian condemns the hubris of multiple-story buildings by comparing the Felicles to the towering homes of the gods. A single insula could accommodate over 40 people in only 3,600 sq ft (330 m2); however, the entire structure usually had about 6 to 7 apartments, each had about 1000 sq ft (92 sq m). The only surviving insula in Rome is the 5 storey Insula dell'Ara Coeli dating from the 2nd century AD which is found at the foot of the Capitoline Hill. Because of safety issues and extra flights of stairs, the uppermost floors were the least desirable, and thus the cheapest to rent. Augustus instituted reforms aimed at increasing the safety of buildings in the city of Rome. Because of the dangers of fire, and collapse, the height of the insulae were restricted by Augustus to 70 Roman feet called the pes (20.7 m), and again by Emperor Nero down to 60 Roman feet (17.75 m) after the Great Fire of Rome. According to the 4th-century Regionary catalogues, there were about 42,000–46,000 insulae in the city, as compared to about 1,790 domus in the late 3rd century. Data on the number of insulae and to a lesser extent domus are used for classical demography. The city's population in the late 3rd century is thought to have fluctuated between 700,000–800,000, down from more than 1 million, based also on figures for the amount of grain required to feed the population in Rome and surrounding areas. ^ Gregory S. Aldrete (2004). Daily Life in the Roman City: Rome, Pompeii and Ostia. Greenwood Publishing Group. pp. 78–80. ISBN 978-0-313-33174-9. ^ Stephen L. Dyson (1 August 2010). Rome: A Living Portrait of an Ancient City. JHU Press. pp. 217–219. ISBN 978-1-4214-0101-0. ^ Chaitanya Iyyer (1 December 2009). Land Management. Global India Publications. p. 147. ISBN 978-93-80228-48-8. ^ Aldrete, Gregory S. (2007). Floods of the Tiber in Ancient Rome. Johns Hopkins University Press. p. 213. ^ Names known from inscriptions or literary sources include Bolaniana, Sertoriana, Vitaliana, Eurcapriana, Felicles or Felicula, Cuminiana, and Arriana Polliana. Brouwer, Hendrik H. J. (1989). Bona Dea: The Sources and a Description of the Cult. Brill. pp. 26–27. ^ "Roman Living: Inside an Insula". Archived from the original on December 18, 2009. Retrieved June 1, 2012. ^ Tertullian, Against the Valentinians 7, as cited by John W. Humphrey, John P. Oleson, and Andrew N. Sherwood, Greek and Roman Technology: A Sourcebook (Routledge, 1998), p. 256 online; Lawrence Richardson, A New Topographical Dictionary of Ancient Rome (Johns Hopkins University Press, 1992), p. 209. Jerome Carcopino hyperbolically calls it a "sky-scraper" in his classic work Daily Life in Ancient Rome, pp. 26 and 28 online in an unknown edition. ^ "Research project: Insula dell'Ara Coeli and the western slopes of the Capitoline". Southampton University. Retrieved 2019-01-25. The Insula dell’Ara Coeli is a part of an extensive archaeological area situated on the western slopes of the Capitol that was exposed though demolition work carried out between 1929 and 1933. ^ Lesley Adkins; Roy A. Adkins; Both Professional Archaeologists Roy A Adkins (1 January 2004). Handbook to Life in Ancient Rome. Infobase Publishing. pp. 154–. ISBN 978-0-8160-7482-2. Wikimedia Commons has media related to Ancient Roman houses. Wikimedia Commons has media related to Ara Coeli Insula.